Given the extreme durations of many of his works, Morton Feldman seems like an appropriate candidate for new media formats offering extended playing times. However, there is nothing on this disc that exceeds half an hour, and as the recordings were made in around seven locations and mostly with different performers, this disc feels more like a compilation, albeit with relatively logical repertoire choices. The disc takes up two Feldman themes, his early work and the music written by his widow after his death. With the exception of the very earliest work, two pieces [for danny stern]everything falls within a recognisably Feldman-esque aesthetic. There are no great discoveries here, and the disc's appeal will probably be limited to Feldman enthusiasts, but there are enough of those out there to make the project worthwhile. The Morton Feldman works date from 1948 to 1972. It is difficult to trace a career trajectory here. Instead, we have the serial, or at least serial-inspired two pieces from 1948, two songs from 1960 and 1962, and four instrumental pieces which are much more typical of the minimalist aesthetic for which he is known. These piece have the same timeless quality as his extended chamber compositions, with two instruments (1958) and dance suite (1963) demonstrating that the Feldman's music is just as effective when presented in small doses as it is when strung out to four or six hours. The two songs are curiosities. The texts are by Pasternak and Thomas Campion, and they both come in at under two minutes. Listening to follow thy faire sunne (1962), the Campion setting for male voice and chime, suggests a vocal quality to Feldman's instrumental works. The individual, plaintive tones of the singer are remarkably similar to the individual string notes in his quartet and quintet writing. Rothko Chapel is about the only vocal work by Feldman to have made a lasting impression, but listening to these short songs, it seems a shame that he did not spend more time writing for voice as it suits his style well. 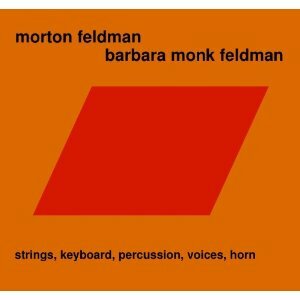 Barbara Monk Feldman was a pupil of Morton and latterly his wife. Her music is very much in the spirit of his, perhaps a little more pedantic in its use of stacked intervals and atmospheric effects, but basically on the same meditative plane. Her works are presented chronologically, and all date from after Morton's death. If anything, there is a gradual move here away from Feldman's aesthetic and towards that of John Cage. duo for piano and percussion (1988) is the most Feldman-esque, while pour un nuage violet (1998) for violin and cello, is more in the spirit of Cage's string quartet works, the individual notes more visceral and with less of that immutable, iconic quality. The performances are generally good, although neither composer makes any great demands on the singers of players. In pour un nuage, the music occasionally goes into parallel octaves or unisons, putting the players' intonation under harsh scrutiny. The recorded sound quality is better in the instrumental works than the vocal ones, which all sound slightly muffled. Which raises the question – why issue this release on audio-only DVD? The extended duration is certainly a benefit, but the audio quality rarely seems superior to CD. There is no surround sound and no visuals to speak of. If anything, the recording, and indeed the whole series (this is the 16th in a run of releases of obscure works from well-known American composers) seems better suited to distribution by download, especially as the box design is cursory at best.